NEW DELHI: In Odisha, a man slung his wife’s body over his shoulder and carried it 10 km after being denied an ambulance on August 24, 2016. Such cases become visible when they get social media and television attention, but millions cannot access India’s overburdened hospitals and inadequate medical facilities, a crisis illustrated by the fact that India is short of nearly 500,000 doctors, based on the World Health Organisation (WHO) norm of 1:1,000 population, according to an India Spend analysis of government data. Up to 55 per cent of India’s 55,000 doctors graduate every year from private colleges, many of which charge illegal donations, or “capitation fees”; in Tamil Nadu, it now costs a medical student from such a college Rs 2 crore to get a MBBS degree, the Times Of India reported on August 26, 2016. “Six states, which represent 31 per cent of India’s population, have 58 per cent MBBS seats; on the other hand, eight states, which comprise 46 per cent of India’s population, have only 21 per cent MBBS seats,” said an unnamed expert who deposed before the parliamentary committee. “However, the committee has been informedA… that doctors cannot be produced overnight, and if we add 100 medical colleges every year for the next five years, only by the year 2029 will the country have adequate number of doctors,” the second expert said. 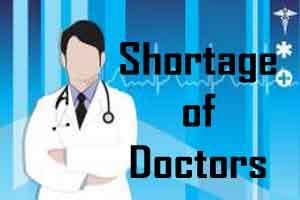 Medical-education shortages manifest themselves in under-staffed public-health services nationwide: There is an 83 per cent shortage of specialist medical professionals in community health centres (CHCs), as India Spend reported in September 2015. Public-health centres across India’s rural areas — 25,308 in 29 states and seven union territories — are short of more than 3,000 doctors, the scarcity rising 200 per cent (or tripling) over 10 years, India Spend reported in February 2016.